On a warm January afternoon, Tesema Merga, a village elder in Endibir, Ethiopia, surveyed the latest improvements to the long dirt road just outside his house. Eventually this road will be paved, which will bring significant changes to the community. Understanding the transformative power of connecting communities, Tesema was part of a vanguard of young Ethiopians who brought road construction to this region in the 1960s. The group of industrious upstarts formed the Gurage People’s Self-help Development Organization, or GPSDO, today one of the oldest NGOs in the country. The new roads not only improved access to health services but also provided new livelihood opportunities. Yet today many communities face entrenched challenges that roads alone cannot fix. A combination of deforestation, localized population pressure, and rural poverty is preventing the region from continuing to grow in a healthy and sustainable way. Videographer Michael T. Miller and I went to Gurage to document how GPSDO is addressing these compound vulnerabilities for the latest short film in our Healthy People, Healthy Environment series (see previous films on Tanzania and Nepal). Paving the Way: Ethiopia’s Youth on the Road to Sustainability explores GPSDO’s efforts to expand access to reproductive health services, encourage healthy land management, and empower young people through an integrated population, health, and environment (PHE) program. 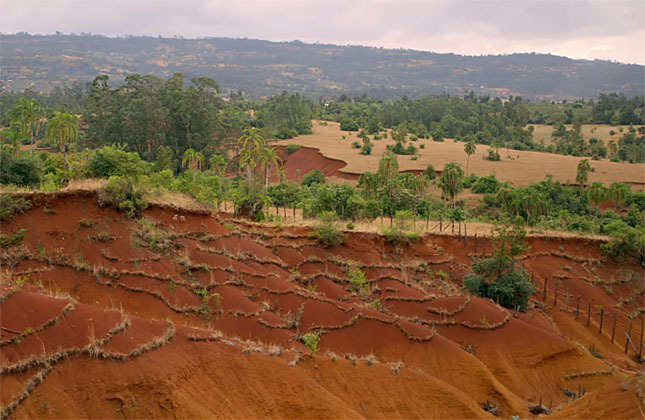 Years of cutting have left only 4.6 percent of Ethiopia’s tree cover. The remaining forests are dwindling at a rate of 0.8 percent each year. Erosion washes at least a billion tons of soil into the Nile very year. Rapid population growth contributes to this scarcity, especially in regions like the Gurage where most people rely on subsistence agriculture. The country’s rural population has more than tripled since the late 1960s, growing to 76 million, as rural women have on average 5.5 children over their lifetimes. Young people (under 25) represent more than 60 percent of the population. GPSDO, like other PHE efforts, sees these trends as connected. Over the last seven years, the organization has tried to address these linked population and environment challenges through its community development projects. Projects like these could help Ethiopia achieve the “demographic dividend” – a scenario where a larger-than-usual ratio of working-age people to dependents leads to increased economic productivity – by helping young people realize their reproductive rights and increase their access to education and employment. GPSDO’s activities rely on volunteers. To bring primary health care to rural areas, GPSDO bolsters Ethiopia’s health extension worker program by training local volunteers to advise new couples on planning their families, advise extension workers on dissemination of care, and help assess local needs. These volunteers boost the capacity of extension workers, who are often stretched thin. 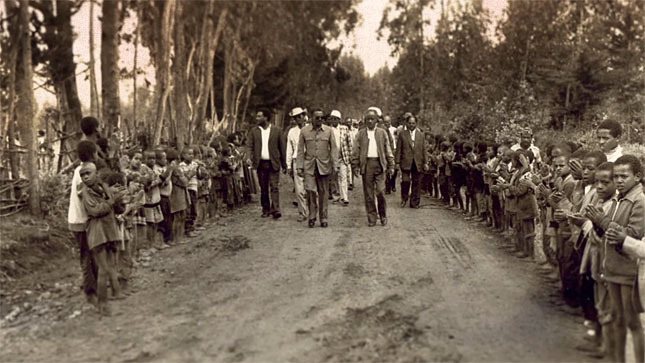 As we walked down Tesema’s unfinished road, a gaggle of young children gathered around him. To encourage more awareness and discussion about population-environment dynamics, GPSO also capitalizes on one the country’s most precious resources. “We decided to involve the youth,” said Tesema. GPSDO recruits and trains energetic teens for PHE Youth Clubs at local schools. These “peer educators” plan their own conservation projects and share information about sustainable development. “I talk freely to my parents about PHE and the importance of family planning,” Desawork Aboneh, 16, a student at Harawiat Prepatory School, told me without hesitation. The PHE youth club talks about things Desawork and her friends are naturally interested in, they told me. Young women also meet separately to have frank discussions about adolescent health, conservation, and plans for the future. These young people refuse to resign themselves to a degraded environment or lack of basic services. For many years, Ethiopia has been an early adopter of PHE projects. Food insecurity, decentralized health clinics, and rural villages make it a perfect testing ground for this integrated approach. The PHE Ethiopia Consortium, a nationwide coordinating organization, conducted some of the first comprehensive evaluations of PHE and has built support and allies among a diverse cross-section of politicians, press, and practitioners. Due to that early investment, districts in the Gurage and other PHE projects in Ethiopia are beginning to see real progress. GPSDO’s focus on young people and newly married couples has increased support for modern contraception among men in districts with PHE projects to more than 30 percent, compared to districts without PHE, where just 7 percent support modern contraception. GPSDO’s efforts have also generated new alternative livelihood opportunities for women. Nearly 200 young women have been trained to build and sell energy-saving stoves, and nearly 58 percent of women living in project districts have a new source of income, from embroidery, sewing, computer literacy, and improved farming techniques, compared to only 16 percent in non-project zones. Throughout the Healthy People, Healthy Environment series, we have documented how addressing gender, building community trust and buy-in, and plugging into existing institutions are keys to a successful PHE project. But since these projects are adaptive and context-specific, one doesn’t always look like the next. In Ethiopia, a mix of youthful energy, elder support, and entrepreneurialism appears to have set the Gurage on course for healthier and more sustainable development. “We girls and boys are equal at school,” Desawork said. “There is no way that we are inferior to the boys.” She and her fellow students made it clear that the younger generation – Ethiopia’s largest generation – want to finish what their parents started. What began as a simple project to bring roads to rural areas has evolved into a complex, integrated development project that will serve many generations in the years to come. Sources: The DHS Program, Ethiopian Institute of Architecture, Building Construction, and City Development, Farm Africa, The Guardian, International Journal of Gynecology and Obstetrics, World Bank. Video and Images: Sean Peoples and Michael Miller/Wilson Center.